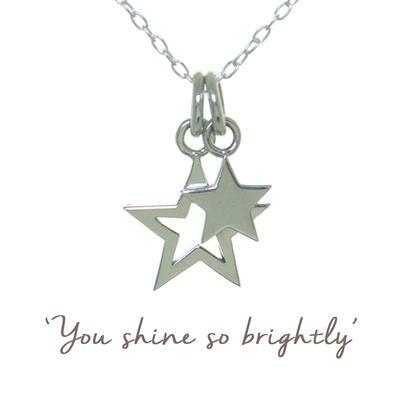 The Double Star necklace, from inhouse brand, Mantra Jewellery is made from 925 Sterling Silver and hangs on a 18-20inch chain. The star represents brilliance. Reach up to the stars and choose to shine every day. This is the perfect gift for someone about to take exams, start a new job and will arrive presented on a beautiful card to keep with space on the back for your personal gift message. Mantras combines the power of words with the beauty of jewellery and is designed to inspire you.